It’s been a while since I added a chapter to the Komodo Chronicles. Sorry about that. 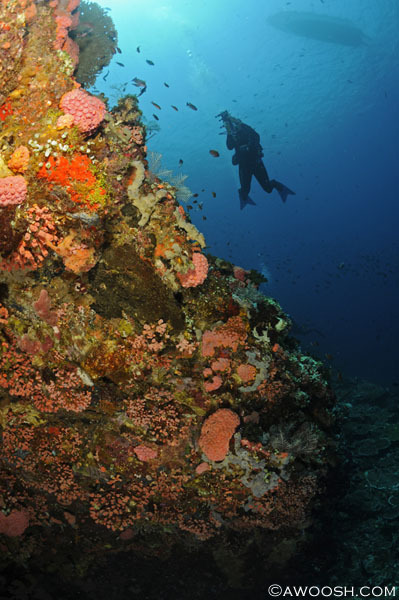 My last entry was about the final few dives we did in the Gili islands, in Northern Komodo. At this point in our trip (about half way through) the crew pointed the boat south, and we headed for the cooler waters of South Komodo and Horseshoe bay (on the south end of Rinca Island). 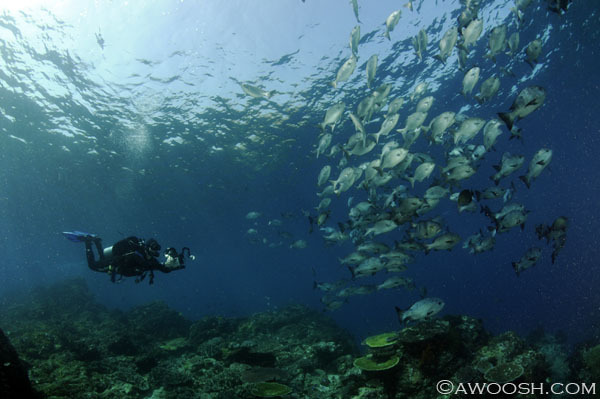 But before we left the Gili’s, there was one more dive to bag. 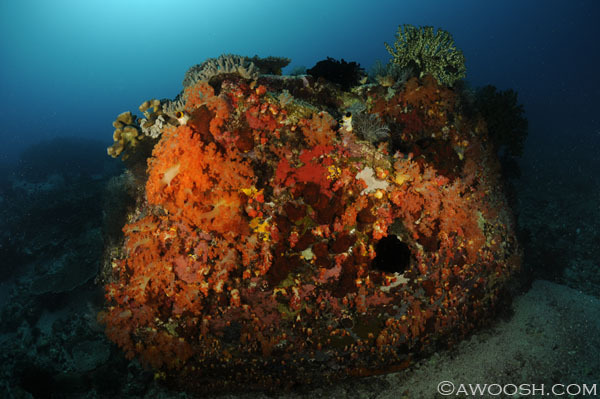 The site was called “Shotgun” and was described to us as a shallow, funnelling, flat approach, with a drop down into a large amphitheater where we would find steep formations encrusted with soft corals and (hopefully) some schooling fish. Again, this dive seems to be very tide dependant, and it would appear that the name “Shotgun” came from some hapless divers who dove it at a full, raging tidal exchange, and were thus shot through the flats and down into the bowl. 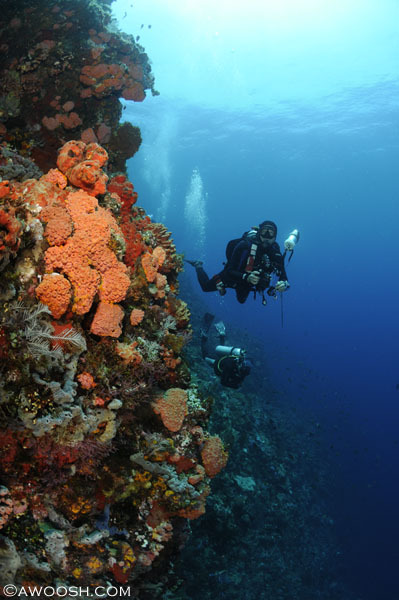 For us, the dive was much more benign – just a gentle current leading us in, and then a leisurely dive in the beautiful bowl, with the current winding back up near the end of the dive. But I could totally see this being a hairy dive when the current was really ripping. The top image in this post is from the flats before the amphitheatre. 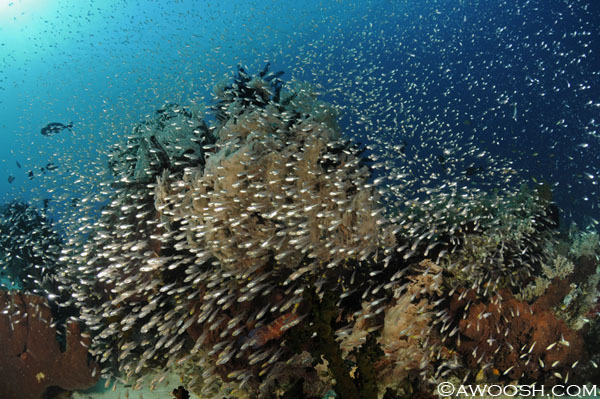 We didn’t see a lot of these swarms of glassy sweepers on this trip, but there were on this little bommie, in full force. Another colourful bommie on the flats, sans sweepers, before dipping down into the bowl. Oh, for some clearer viz. This dive was on the murky side, as my images confirm. 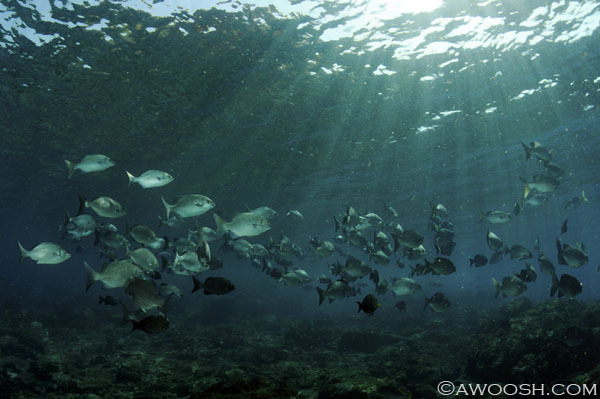 Still, seeing big schools of fish in the sun rays is a very heartwarming experience, good pix, or not. At the bottom of the bommie, looking up. 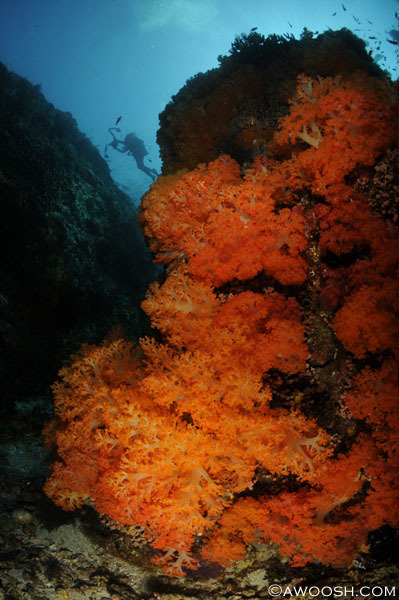 I did not use any colour correction or enhancement – the soft corals really were that incredible reddy orange. Kiddoc and his video rig go to school. Yet more outrageous soft corals. Heading south after this pretty and fishy dive, we passed through an area known as “Current City” – a wide, fairly shallow channel between Komodo Island and the island of Flores. 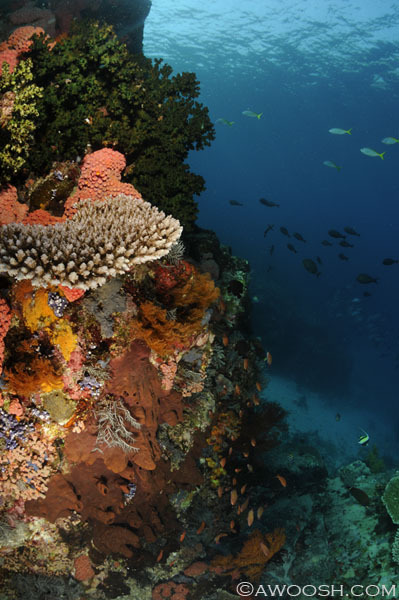 When I visited Komodo in 2009 with my family, we dove a site in this area that the guys on the Nusa Tara (the modest Grand Komodo live aboard we were diving from) called ‘Current City’. Back then, when we pulled up to the dive site, we could see a wild ripping current over top of a very shallow reef (maybe a couple of feet deep). Our kids looked at the surface conditions and wisely decided to sit the dive out. Mr G and I, being pretty experienced in strong current, thought we’d give it a whirl. And what a ride it was – our first ever uncontrolled elevator ride down – bottom floor at about 120 feet. It is disconcerting (to say the least) when you are fully laying air into your BC (buoyancy compensating vest) with the inflator, and finning up as hard as you can, and you are still going down. When we finally were able to stop the insanity, down in the depths, we gave each other big eyes through our masks, and made a plan to swim laterally along the reef a bit, in hopes of getting out of the waterfall. This was a wise strategy, as we would otherwise have been trying to climb the reef to get back into the shallows. Fast forward a few years, and there we were again, in “Current City” – which the guys on the Dancer told us is not really a specific dive site name, more the name of this whole area that is subject to some wicked currents – Linta Channel. 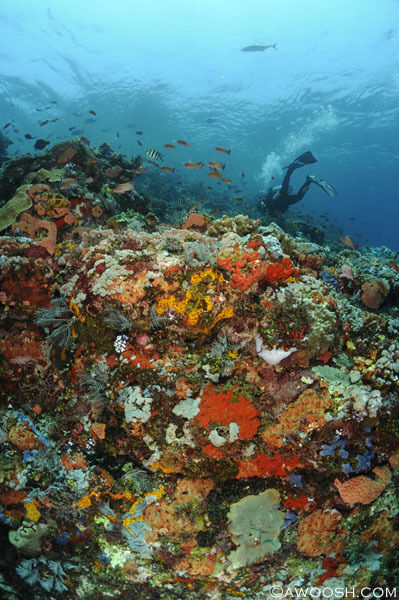 The site on this day was called Batu Bolong – batu being a rock in Indonesia. 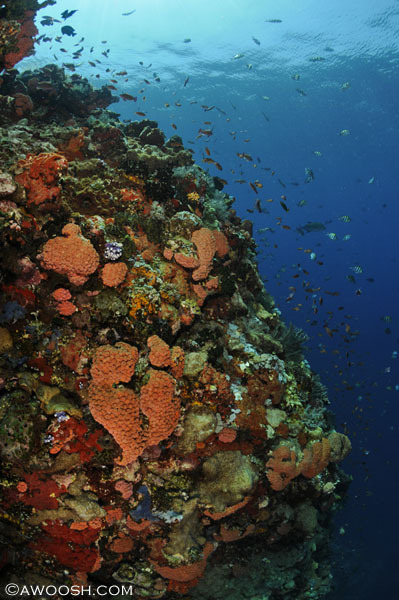 The rock broke the surface into a small islet, and beneath it was a large, tall pinnacle with a shallow fringing reef before it dropped off, in some places, quite dramatically. 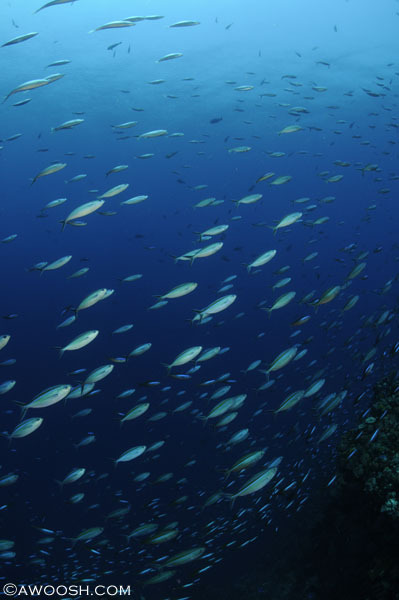 The plan was to start on the lee side, out of the current, in a hard coral garden, and then make our way around, into what should have been an abating current, to a side of the pinnacle with steep walls, and, hopefully, schooling fusiliers and sweetlips. 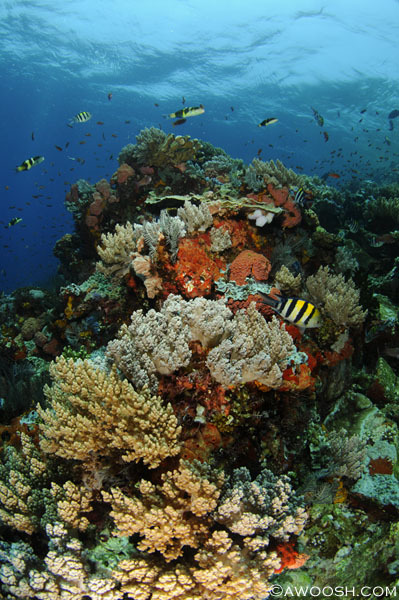 More pretty hard coral gardens in the lee. Mr G in fine form. 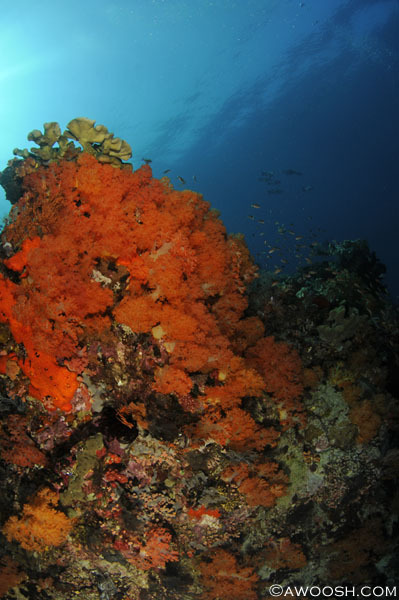 At night, those orange clump thingies would be open into gardens of yellow cup corals. That would be quite a sight. And the promised Fusiliers Fly By. 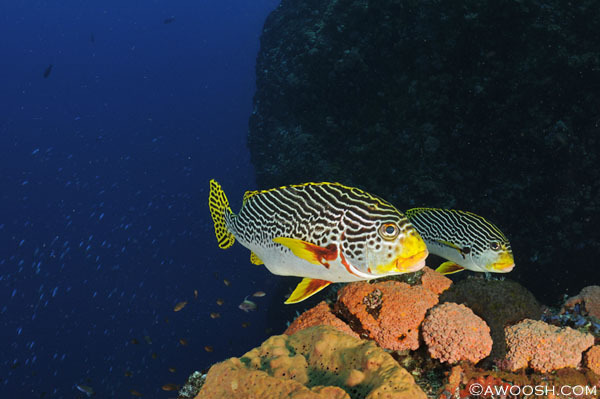 This entry was posted in All About Scuba Diving, Indonesia Travel, Photography, Travel, Trip Reports and tagged Current City, Diagonal Banded Sweetlips, Komodo Scuba Diving, Plectorhinchus lineatus. Bookmark the permalink.